Ursodeoxycholic acid is an important clinical drug in the treatment of liver disease. In our previous work, ursodeoxycholic acid was prepared by electroreduction of 7-ketolithocholic acid. 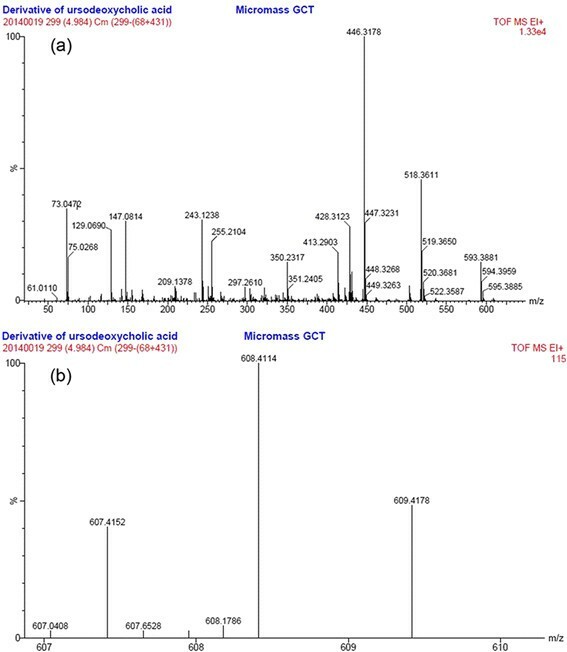 The separation of ursodeoxycholic acid from the electroreduction product (47% (w/w) ursodeoxycholic acid) by silylation crystallization is described herein. N,N-dimethylformamide was used as the solvent, whereas hexamethyldisilazane was the reaction agent. The optimal material ratio of electroreduction product/N,N-dimethylformamide/hexamethyldisilazane was found to be 1:10:2 (w/v/v). The reaction proceeded for 2 h at 60°C, and the corresponding silylation derivative was separated by crystallization and pure ursodeoxycholic acid was recovered by 5% acid hydrolysis at 50°C for 0.5 h. The maximum recovery and purity of ursodeoxycholic acid were 99.8% and 99.5%, respectively. Ursodeoxycholic acid with high purity and high recovery can be prepared directly. The developed method offers a potential application for large-scale production of ursodeoxycholic acid. Ursodeoxycholic acid (3α, 7β-2-hydroxy-5β-cholanic acid, UDCA) is an important clinical drug used in the treatment of liver disease, such as gallstones [], alcoholic fatty liver [], nonalcoholic fatty liver [], viral hepatitis [], primary biliary cirrhosis [], primary sclerosing cholangitis [], and cholestatic []. UDCA was originally separated from the black bear []. In our previous work, UDCA was prepared by electroreduction of 7-ketolithocholic acid (3α-hydroxy-7-oxo-5β-cholanic acid, 7K-LCA) []. UDCA and its epimer chenodeoxycholic acid (3α, 7α-2-hydroxy-5β-cholanic acid, CDCA) were both reduction products of 7K-LCA; thus, the product of this electrochemistry conversion was a mixture of 7K-LCA, UDCA, and CDCA, which are difficult to separate. This problem limits its application in the production of UDCA. The structures of UDCA, 7K-LCA, and CDCA are shown in Figure 1. The structure of UDCA, 7K-LCA, and CDCA. (a) UDCA, (b) 7K-LCA, and (c) CDCA. Researchers have focused on the separation and purification of UDCA. Guillemette et al. [] described the purification of UDCA by reacting an aqueous alkali metal salt solution of UDCA in the presence of chloroform with an acid to recover crystalline UDCA. Bonaldi et al. [] prepared high-purity UDCA, starting from cholic acid by forming the tris-trimethylsilyl derivative acid thereof, reducing the acid by the Wolff-Kishner method into UDCA, and the total impurities were less than 1.3%. Xu et al. [] separated UDCA from its isomeric mixture using a core-shell molecular imprinting polymer, and the separation factor of the molecular imprinting polymer with acrylamide for UDCA was 2.20. Tian et al. [] produced UDCA by catalytic transfer hydrogenation of 7K-LCA with Raney nickel, then UDCA was purified by column chromatography and recrystallized. Ninety-seven percent UDCA was obtained via this last method. Silylation is a powerful tool to improve the production process and the quality of the product in modern pharmaceutical and organic synthesis, and has been applied in increasing the volatility [], changing the solubility in organic solvents [], and the protection of sensitive functional groups such as hydroxyl and carboxyl moieties []. Silylation of alcohols and phenols with hexamethyldisilazane (HMDS) has been achieved using various types of catalysts [–]. The reaction conditions were nearly neutral, and the corresponding silyl ethers yields were high. Mormann et al. [] reported the silylation of cellulose by HMDS in liquid ammonia and the reaction gave high degrees of silylation. In this work, UDCA was isolated from the electroreduction product with analogues by silylation crystallization and UDCA. The process afforded UDCA with high purity and high recovery via a direct method. The standard samples of UDCA, CDCA, and silylating reagents were purchased from Aladdin Chemistry Co. Ltd (Shanghai, China). 7K-LCA was prepared according to our previous work []. Acetonitrile and methanol were of high-performance liquid chromatography (HPLC) grade and purchased from Shanghai Xingke Biochemistry Co. Ltd (Shanghai, China). All other reagents were of analytical grade. HPLC (LC-20A, Shimadzu Corporation, Kyoto, Japan) with a UV detector (SPD-20A) using a C18 column (Welchrom-C18, 4.6 × 150 mm, 5 μm, Welch Materials Inc. Shanghai, China) was used for quantification of the reaction products. 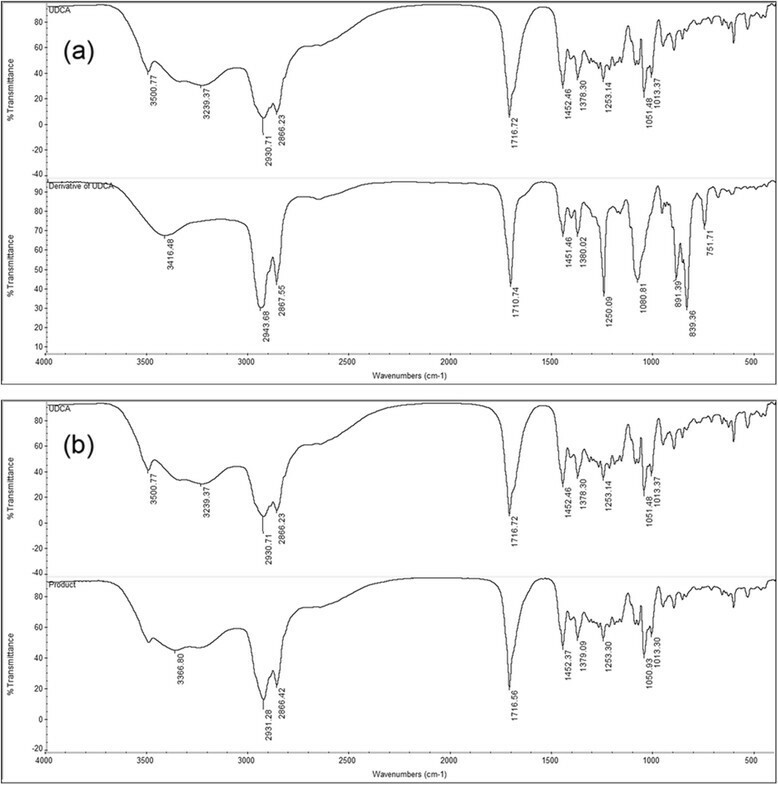 Electron impact ionization time-of-flight mass spectrometry (EI-TOF-MS) (Micromass GCTTM, Micromass UK Ltd, Lancas, UK) and Fourier transform infrared spectroscopy (FTIR) (Magna-IR 550, Thermo Nicolet Ltd, Wisconsin, USA) were used for the characterization of the product and provided by the Analysis and Test Center, East China University of Science and Technology. HPLC was used to analyze the product. The mobile phase was a mixture of phosphate acid buffer (pH 3.0) and acetonitrile (50:50, v/v) at a flow rate of 1.0 ml/min at 25°C. Detection was performed using a UV detector at 208 nm. UDCA was quantified by an external standard. EI-TOF-MS was used to identify the molecular weight of the derivatives. FTIR spectra with KBr pellets were used to analyze the structure of the product and the standard UDCA. The synthesis procedure followed Yuan's method []. UDCA was synthesized in a divided electrolytic cell by direct electroreduction of 7K-LCA. A titanium ruthenium mesh electrode was used as the anode, and a high-purity lead plate was used as the cathode. Under the optimized process conditions, the content of UDCA was 47%. Silylation crystallization experiments were carried out as below. One gram of the electroreduction product (47% (w/w) of UDCA) was added into a 100-ml conical flask containing 10 ml N,N-dimethylformamide (DMF) at 30°C, and following the dissolution of the material under magnetic stirring at 150 rpm, 1 ml of HMDS was added into the solution. The conical flask was sealed with thread seal tape. The reaction was carried out for 2 h at 30°C at a speed of 150 rpm. After the reaction was complete, the flask was moved to glacial water and maintained at 0°C for 24 h. The crystalline material was collected by filtration and washed with the same silylating reagent and dried in a vacuum oven. The silylation derivative of UDCA was then added to a 5% solution of hydrochloric acid, and the suspension was warmed to 50°C for 0.5 h. After being cooled, the precipitate was collected by filtration, then washed with deionized water and dried in a vacuum oven. The recovery and purity of the product were measured. The reaction formula is shown in Scheme 1. The reaction formula of silylation and hydrolysis. (a) The silylation reaction formula. (b) The hydrolysis reaction formula. 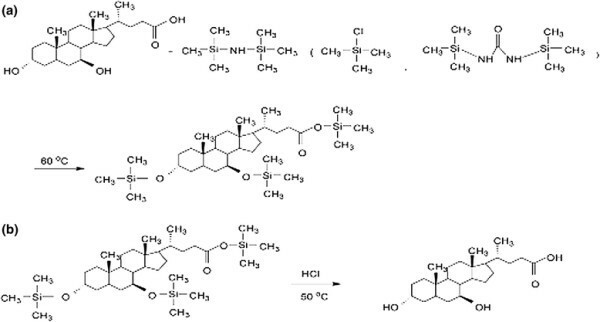 The different silylation derivatives, effects of silylation reagent types, temperature, and material ratio were measured. There are many kinds of silylation reagents. In this study, hexamethyldisilazane (HMDS), trimethylchlorosilane (TMCS), and 1,3-bis (trimethylsilyl) urea (BSU) were chosen as the silylating reagents. 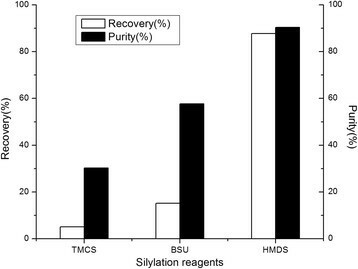 The effect of different silylating reagents on UDCA recovery and purity is presented in Figure 2. These results indicate that the silylating reagent has an important effect on the recovery and purity of UDCA. In this study, when HMDS was used as the silylating reagent, maximal recovery and purity of UDCA were achieved with values of 87.7% and 90.4%, respectively. Selection of the silylating reagents. Temperature 30°C, 1 g electroreduction product, 10 ml DMF, and 1 ml TMCS (1 ml HMDS or 1 g BSU). Since the boiling point of TMCS is 57.7°C, the reaction took place intensively after TMCS was added to the system under the experimental temperature (30°C), and TMCS evaporated. Consequently, the contact between reactants was reduced, and this made the final product yield lower. BSU is a silylation reagent that can increase the solubility of the derivative of UDCA in DMF, so it is difficult to form a precipitant. HMDS, the commercially available reagent for trimethylsilylation of reactive hydrogen, is stable and yields ammonia as the only by-product, which is simple to remove from the reaction medium. Therefore, HMDS was chosen for the following study. Since a silylation reagent can replace the hydroxyl groups in UDCA, CDCA, and 7K-LCA, the difference between their corresponding silylation derivatives was the key to the subsequent success of the separation step. As such, silylation was conducted using standard samples (UDCA, CDCA, 7K-LCA, and their mixtures at different proportions) as the silylation reaction substrates and HMDS as the silylation reagent. The difference between the silylation derivatives of UDCA, CDCA, and 7K-LCA is presented in Table 1. The results showed that crystallization was only observed when UDCA was present in the sample. When CDCA and 7K-LCA individually or together were used, no crystallization was observed. The tris-trimethylsilyl derivative of UDCA has very low solubility in organic solvents, whereas the derivatives of 7K-LCA and CDCA are highly soluble in the same solvents. This suggested that HMDS can be used to isolate UDCA from CDCA and 7K-LCA. Temperature 30°C, 1 g electroreduction product, 10 ml DMF, and 1 g HMDS. The silylation reaction is a strongly exothermic reaction. Thus, temperature could affect the reaction to some extent. Thus, silylation was conducted over the temperature range of 20°C to 70°C. The effect of different temperatures on UDCA yield is shown in Figure 3. In the range of 20°C to 70°C, the yield of UDCA increased as the reaction temperature increased. This indicated that the reaction was an endothermic reaction. When the temperature was 60°C, the recovery and purity of UDCA were 95.6% and 97.5%, respectively. The use of higher temperatures did not lead to further increases in yield. Consequently, 60°C was chosen for the following study. Under this temperature, the reaction was mild and only a small amount of ammonia was produced as a by-product. Influence of different temperatures on silylation. 1 g electroreduction product, 10 ml DMF, and 1 ml HMDS. The ratio of reactants needs to be controlled, so silylation was conducted at different material ratios of electroreduction product, DMF, and HMDS. Table 2 presents the effect of different material ratios on the yield and purity of UDCA. Temperature 60°C; silylation reagent, HMDS. When the material ratio of electroreduction product/DMF/HMDS was 1:10:2 (w/v/v), the recovery and purity of UDCA were 99.8% and 99.5%, respectively. With 1 ml HMDS present, the reaction did not complete; however, when 3 ml of HMDS was used, the silylation derivative of UDCA did not readily form a crystal because of the increase of HMDS in the solution. A comparison of group 2 with groups 4, 5, and 6 showed that excessive crude UDCA made the reaction system too viscous to react. After being hydrolyzed and dried, the product was determined by HPLC, EI-TOF-MS, and FTIR. As presented in Figure 4a, the retention time of the product was 6.3 min and consistent with the standard HPLC spectrum of UDCA (Figure 4b). In the range of 0 to 20 mg/ml, the peak area of the standard UDCA sample and its concentration gave a linear correlation, with the standard curve of UDCA being A = 226,034.6C + 18,928.2 (A is the for peak area, C stands for concentration, R2 = 0.9997). The sample was run under identical conditions as the standard UDCA material, and the recovery and purity were calculated according to an external standard method. The HPLC spectrum of the product and standard spectrum of UDCA. Mobile phase was a mixture of acetonitrile and phosphate acid buffer (pH 3.0) with a volume ratio of 50:50 at a flow rate of 1.0 ml/min at 25°C. (a) Standard UDCA and (b) product. The EI-TOF-MS spectrum of the tris-trimethylsilyl derivative of UDCA is shown in Figure 5 and Table 3. The spectrum showed its characteristic fragmentation ions at m/z 608 (100), 593 (14), 518 (45), 446 (100), 428 (28), 413 (18), 350 (14), 243 (30), 147 (30), and 73 (34). The evaluation formulas corresponding to these fragments are listed in Table 3. As observed, the ion at m/z 608 corresponds to the tris-trimethylsilyl derivative of UDCA (C33H64O4Si3). This result proved that the reaction proceeded and indicated that the active hydrogen atoms of the three hydroxyl groups on UDCA were substituted by silylation. The EI-TOF-MS spectra of the derivative of UDCA. (a) The m/z ranged from 0 to 600. (b) The m/z ranged from 605 to 610. Multiple mass analysis, 37 mass(es) processed. Tolerance = 5.0 mDa/double bond equivalents: min = −1.5, max = 50.0. Isotope cluster parameters: separation = 1.0, abundance = 1.0%. The FTIR spectrum is shown in Figure 6. It indicated that -Si-O- (839.36 cm−1, 1,080.8 cm−1), -Si-C- (1,250 cm−1), -C-H (2,867.6 cm−1, 2,943.7 cm−1), and -CH3 (1,380.0 cm−1) existed in the structure of the derivative of UDCA. Thus, the silylation reaction was confirmed, and the FTIR spectrum of the product is consistent with the standard FTIR spectrum of UDCA. The FTIR spectrum of UDCA, derivative of UDCA, and product (KBr pellet). (a) UDCA and derivative. (b) UDCA and product. Ursodeoxycholic acid was purified by silylation crystallization in this study. By optimizing process conditions, recovery and purity of ursodeoxycholic acid was up to 99.8% and 99.5%, respectively. 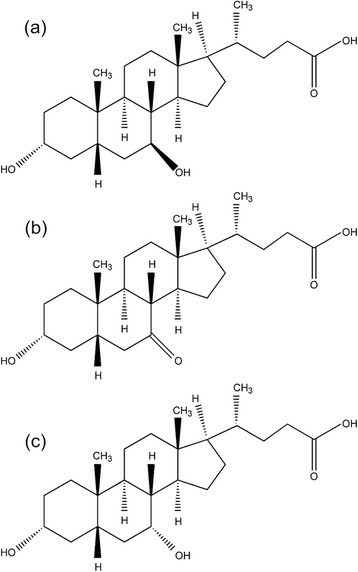 HPLC, EI-TOF-MS, and FTIR analysis showed that silylation is a highly efficient purification method of ursodeoxycholic acid. 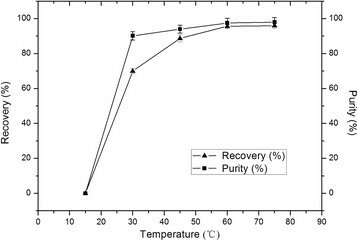 Compared with previous methods, the UDCA preparation methods presented herein (i) gave higher purity and recovery, (ii) avoided cumbersome procedures, (iii) was more cost efficient, and (iv) did not require harsh reaction conditions. The silylation crystallization approach was easy to operate, economic, and timesaving, and the by-product (i.e., ammonia) was simple to remove from the reaction medium. XLM designed the study; collected, processed, and analyzed the data; and wrote the article. XJC contributed to study design and article corrections. Both authors have read and approved the final manuscript.